Does your ISP give you a dynamic IP (most do)? Have you ever tried setting up a server from that Internet connection, setting up your Slingbox for Internet viewing or setting up a slew of IP-dependent services? Chances are those things broke when your IP changed and you had to reconfigure them. Enter DNS-O-Matic. 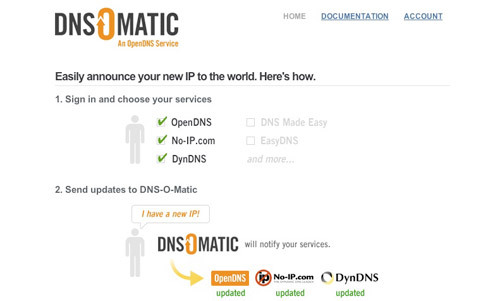 A project from the folks at OpenDNS, DNS-O-Matic "gives you a free and easy way to announce your dynamic IP changes to multiple services with a single update." When you login to DNS-O-Matic using your OpenDNS credentials, you can add dynamic DNS services such as DynDNS, EveryDNS, OpenDNS, ZoneEdit and countless others. (If you'd like DNS-O-Matic to support another service, just let them know and they'll add it.) Then you install a local client that informs DNS-O-Matic of your new IP and updates your IP on the services you've added. This makes it easy to update your IP across multiple dynamic DNS services. I'm not going to lie - a good chunk of the people reading this post won't even have a remote use for DNS-O-Matic. But for the people that rely on dynamic DNS services to ensure they maintain their connection configuration, DNS-O-Matic will be a lifesaver. Down the line, I can imagine router manufacturers like LinkSys and Netgear, startup service providers and so on supporting DNS-O-Matic as it supports many services in itself, saving them from having to support multiple DNS services. Most routers only support DynDNS if anything.